iBlog: The 14th Philippine Blogging Summit #iblog14| Discussing what matters for the growth of blogging and social media community. iBlog: The 14th Philippine Blogging Summit (#iblog14) will be on November 24, 2018 at the Malcolm Theater, UP College of Law, UP Diliman, Quezon City from 8:30 am to 5 pm. Our theme this year is on “Vigilance Online & Offline: Bloggers & Digital Influencers Speak Out”. We are thankful to eTaxpoint Software Solutions Corp. for signing up as a gold sponsor for this event. We greatly appreciate it. #iblog14 is a FREE event. It is a popular gathering of newbie, novice, and veteran bloggers, social media users, new media publishers. We tackle topics and themes that are relevant to the online community. How to be a vigilant blogger? How to speak out on issues using blogs and social media? 11:45 – 12:15 SPONSOR Keynote – eTaxpoint Software Solutions Corp.
* Program agenda is subject to change. 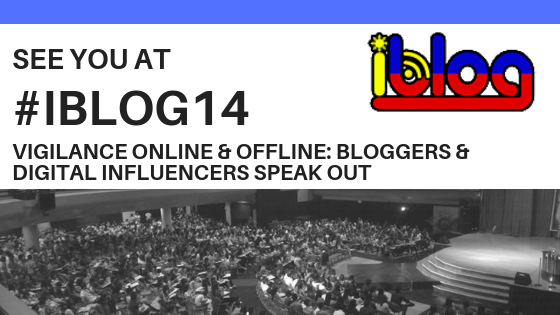 We will once again have iBLOG: The 14th Philippine Blogging Summit (#iblog14) — an open event for the Filipino blogging and social media users community. #iblog14 is an interaction event where established and upcoming Pinoy bloggers give informative talks. More than 300 bloggers from all over the country make time to attend it as well. For the past thirteen years, we served as a venue to learn blogging, transition of bloggers to digital influencers, ethics, country issues and why bloggers should care, advocacies, make blogging sustainable and generate income from it. The 14th Philippine Blogging Summit will be held this November 24 at Malcolm Theatre, College of Law, University of the Philippines, Diliman, Quezon City. 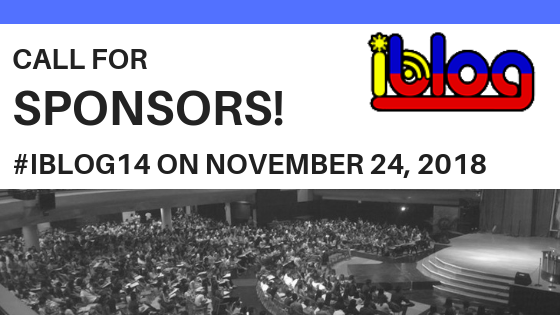 We are extending a special opportunity for companies to support this major event for the Philippine blogging community. Increase your visibility through this one-of-a-kind event. As #iBLOG14 is a non-profit event, all fees are requested to be made payable to our event suppliers who shall in turn issue the corresponding official receipts. We encourage interested sponsors to get in touch with us. Hello everyone. We are now gearing up for iBlog: the 14th Philippine Blogging Summit (#iblog14). In this regard, we would like to invite interested speakers to submit a topic proposal for consideration on or before November 4, 2018.
iBlog14 will take place at UP College of Law this November 24, 2018 at Malcolm Theatre, Malcolm Hall, UP Diliman Quezon City. We typically covers topics that aim to expand the blogger’s perspective on various issues and developments. Submit your topic proposal on or before November 4, 2018. The approved topics and speakers for the summit will be posted soon.